Corporate Social Responsibility has become more of a necessity than a managerial choice in modern business. In this age of social media, businesses are finding it tougher by the minute to keep their employees and customers from airing out dirty laundry in public. Socially irresponsible company activities and negative customer and employee experiences are tweeted and shared and faster than a mean flu in the winter, leaving little or no space for companies to defend themselves or conduct any meaningful damage control. Walmart is perhaps one of the best examples of companies that have been at the receiving end of an online public battering from customers. All the well-crafted public relations videos of happy customers on Walmart’s YouTube page must feel like a huge waste of money as customers and employees continue to post public-shaming videos of the company’s conditions of service. Once one negative video gets “tweeted” by a few people, there is usually no way to stop the avalanche of negative comments that follows. Human beings tend to want to conform to their peers, therefore one negative comment breeds another, and any contrary opinion from your more optimistic customers is quickly swept under. Such is the reality of the supreme court of public opinion, and you just have to deal with it… but how? The unlikely answer to that lies in a merger between your corporate social responsibility strategy and your public relations strategy. Gone are the days when businesses operated like faceless secret societies and maintained fancy mysterious stories of secret product recipes from a far-off exotic island. Let’s face it, whatever product you are selling, you probably have a competitor who can do it as well as you can, what’s going to set you apart is your customer care policy and how much thought you put into the people that make your company great. That usually means letting your guard off a little bit; taking better care of your employees, loosening the purse strings and donating to charity, embracing more sustainable ways of production for your environment-conscious customers, making your public spaces friendly and accessible for the disabled and other purpose-driven initiatives. Most CEOs look at such activities as mere corporate social responsibility, a minor distraction from business-as-usual, but successful brands carefully craft a public relations strategy around it that sways public opinion, creating a “People’s business”, rather than a just another “Wall Street company”. Sometimes, to win over the public, you need to open up to the public, like a boxer doing a rope-a-dope. Chipotle is one company that has embraced this ideology. The restaurant chain decided to open up their kitchen spaces for diners to be able to see how their food is prepared, and even take pictures. Chipotle seems to be putting themselves in a tight corner, open to criticism and public shaming, but the results are directly opposite. The high standards of their kitchen set-up means the critics have very little to munch on, meanwhile the Chipotle scores a knockout from a rope-a-dope by building up some positive PR as customers share their unique but positive experiences on the social media. In today’s dynamic business environment, consumer expectations are harder to meet than ever before. Most companies understand that they need to keep up or pack up. 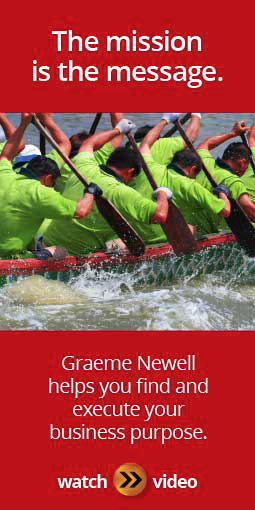 Graeme Newell’s Red Goldfish book introduced towards the end of the video is a great resource for anyone who wants to see practical examples of how some companies are evolving their businesses to cope with their ever-evolving customer relations environment, just by developing a written sense of purpose for the business, then walking the talk. The video also contains some links to some great online resources and training materials for managers who have already taken the great leap forward to creating purpose-driven companies but need a little help in refining their plans.